Hard to believe we've been in Lazio over two weeks and I've told you nothing. We have been busy. When we arrived we found our water supply disconnected, Mr FF discovered a leak in the pipe above our house, inadvertently repaired major leak to the nearby sports ground and finally fixed our minor leak, all of which occupied him for two days. The supply pipe is not very far into the ground and it seems that heavy traffic or parked cars can press the pipe onto stones and fracture it. Since two of the houses in our little road of four are for sale it's unlikely that we will upgrade the supply for a while but it would make sense to do so one day. We've done some socialising, a couple of long lunches with friends and last Sunday along with many others took part in a 16 k walk, such fun. I'll give you a full post later but let me tell you I've done a lot of long distance walking, it's the first time wine, limoncello and grappa have been offered at a drinks stop. Mr FF and his concrete mixer continue working at the the back door and I have gardened furiously. While we were in Scotland Mario had pruned the olives and planted broad beans, I've added sunflowers and nasturtium, bought a dozen tomato plants and I'm waiting to sow more flower seeds. My little lemon tree survived the winter as did my geraniums. Such a gorgeous time to be here, the hillside is covered in blossom and wild flowers, the days get warmer though we have eaten breakfast outside since we arrived, the cuckoo is about. Everything is as it should be apart from my lack of blogging but we blame that on the iPad don't we. So we had an eventful 11 hour journey to Lazio. We had decided to travel with British Airways on two flights via Heathrow using up some air miles and allowing us to travel with hold and cabin luggage at no extra cost, and I hoped mean we would get a snack or two on board. stay and apologise for the seat mix up. First time I've ever travelled any way but in the cheap seats apart from once to America in premium economy. If BA flew direct to Rome from Edinburgh I'd happily pay the difference to travel in style, as it is I have no idea how Mr FF plans to get me on the free for all, pay for everything and don't bring any luggage or expectations of customer service Ryanair flight home . Luckily that won't be for a few weeks, and yes the sun is shining constantly. I was very pleased with the way Amelia's little ballet wrap turned out, the bamboo yarn knitted up well and I liked the twisted rib detail. I posted her gift last week and shortly afterwards received this lovely thany you card. The sleeves were slightly shorter than I'd imagined but Amelia's Mum said they looked fine, with plenty of movement for Port de Bras as we dancers say. So Amelia was looking forward to wearing her wrap when class restarted after the Easter holiday. Amelia wore her new ballet wrap to her class on Sat. Her teacher, Miss Lucy was standing by the door as she was going in and said to Amelia 'Oh this is very swanky, who has been knitting for you?' Amelia pushed out her chest and very proudly announced 'Auntie Jen'!! Bless her she was very impressed, firstly with her new wrap and secondly that Miss Lucy liked it too. I'm quite inclined to push out my own chest, the patchwork aran is finished. I am pleased firstly because I managed to find enough yarn to complete it and secondly because it is gorgeous, quite heavy but so interesting and very warm. Once I was familiar with the various patterns I really enjoyed myself twisting all those cables, apart from some shedding of yarn which involved short and slightly curly grey hairy bits drifting round the lounge. We won't go there or discuss Mr FF's comments. 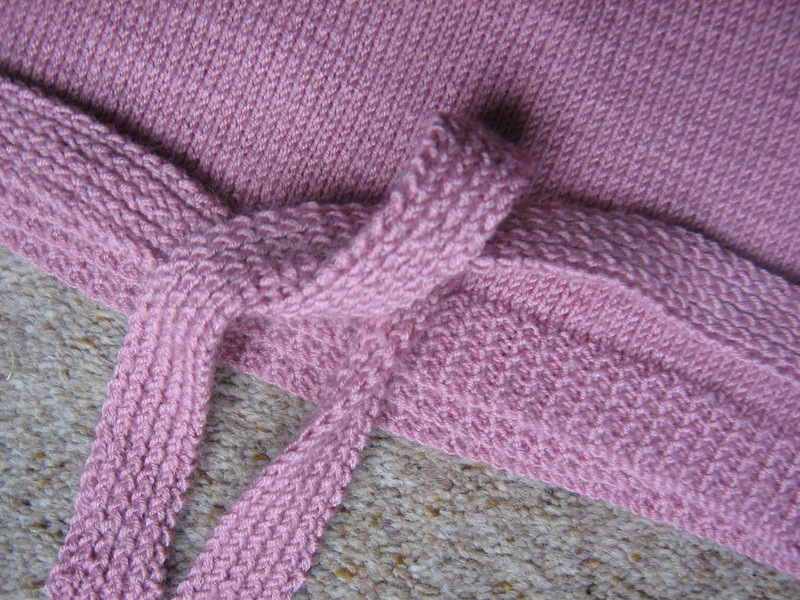 So back to socks for now, to be knitted in Italy hopefully outdoors in the sun. Although its been very cold it has been exceptionally dry so I have managed to get out into the garden for tidying and cutting back while Mr FF has taken down a few trees to let more light in and provide fuel for the stove. We still have snow on the ground and the wind continues to be icy which means this year everything is delayed. My hellebores have done their best but took quite a battering, freezing under the snow and only now recovering. They are so gorgeous and exotic, some of my favourite flowers. But the forecast in our part of Lazio by next Saturday is for temperatures of 20 degrees. Now that's a tough choice, spring bulbs or sunshine, maybe I'll just shut up and go paint my toe nails for the first time this year. I'm not a great hoarder (yarn doesn't count) but I really have been trying to get rid of clutter this year in the hope that we might eventually downsize and in the meantime enjoy this house more and more as it improves. Mr FF has done quite a lot of sanding down and painting or re-varnishing, we are looking smart but he in particular finds it impossible to let go. Here's an example of not letting go, when we had our first house in the 70s we bought from a friend for £40 a G plan dining table with four upholstered chairs. More than 20 years ago we stopped using the table but kept it, it was circular teak and extended into an oval to seat up to 6. The wood was lovely, the extension worked smoothly but we didn't need it. Eventually I advertised it in the village as free to a good home no takers, I tried to give it to a charity but none would come out from Edinburgh for it. One cheeky organisation said they would only take the table if it came with chairs, by this time it didn't. Finally friends of a friend were delighted to have it for their holiday house and gave us a bottle of wine. Now we have in the front room a low white bookcase and a couple of low cupboards, we bought them again for our first house 30 odd years ago. They are so dated I've taken to putting a throw over the brown fronted cupboards, I keep the Christmas decorations in there and not much else so they serve no great purpose. Again Mr FF has explained to me how well made the units are, that he doesn't mind the dated style, that they are much better than anything you'd find in Ikea. Fair enough, but I don't want to replace them with anything from Ikea or anywhere else, I want them to go and leave a space in the room. I had a look through our collection of photographs last week and while they need more sorting I threw out the ones of people and places I didn't recognise, a sure sign they'd been kept too long. And don't get me started about Mr FF's amazing selection of construction industry slides, yes slides you remember those don't you. They live in these boxes under his desk and relate to his last but one job that he hasn't had for at least 5 years. He promises me he's going to sort them out and keep just the good ones as there are some really interesting images, there are 1000s. He did offer them to a couple of engineering related organisations but no one was interested. At least he has now disposed of his projector and light box which gives me hope the slides will go soon. Then he can get started on his office bookcase, all these dull tomes, technical papers and magazines, I'd love to have some of this space free and make our office a bit calmer (perhaps even a bit more studio-ish). I know its not easy to let go of these tangible parts of life and particularly things associated with a long and happy career but there is a part of me that resents having to live with unused clutter.